Be sure to sew a hanging sleeve to the back of small quilts. A sleeve might not be needed, but does make quilt display more versatile. 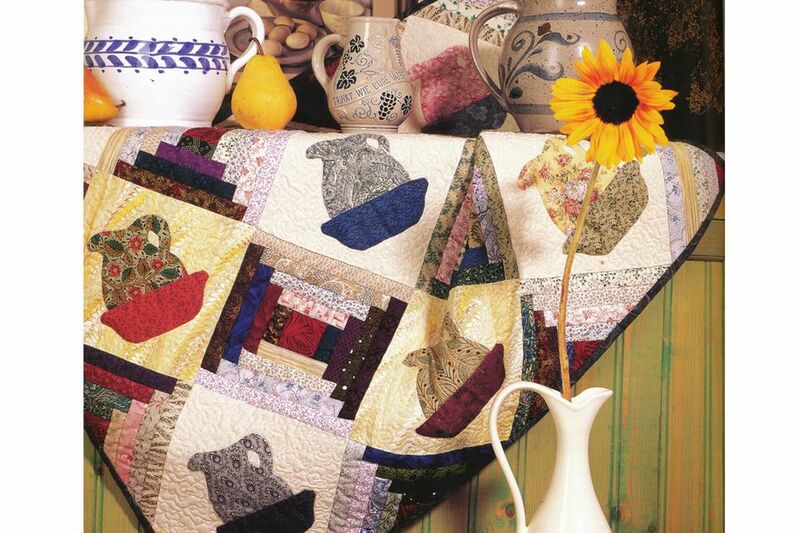 Pitchers for Tildy's Cabin is a wallhanging made from a combination of applique pitcher blocks and foundation pieced Courthouse Steps quilt blocks (a variation of the traditional Log Cabin design). Stitch a TARDIS quilt for your favorite Doctor Who fan. The quilt finishes at about 30" x 42" -- the perfect size to fit on nearly any wall. Construct this 24" square wallhanging quickly using the fusible web technique. This little wallhanging pattern can also be used as a colorful throw pillow cover. If you're not into fusible web, use any method to appliqué patches to the background. Make 15" square basket quilt blocks in traditional Amish style, or vary your fabrics for a completely different appearance. The pattern includes instructions for single quilt blocks, perfect for scrap quilts. On page 3 you'll find directions to help you make the 63" x 63" wallhanging illustrated here. Use a simple quilt block to make a quilt like this or change its layout entirely by rotating quilt blocks. The finished quilt measures 33-1/2" x 39-1/2". Carolina Byways is made with 6" Split Nine Patch quilt blocks. The blocks are all strip and quick pieced. The pattern also includes instructions for a miniature version sewn with 3" blocks. Which Way Do We Go was inspired by a colorful Alexander Henry border print. To make the quilt, winged square blocks are sewn into columns with setting triangles. A slice of the border print separates each row. Quick-pieced flying geese soar above and below the winged squares. This wallhanging is not difficult to make, and you can change its character entirely by selecting different types of fabrics or using an alternate arrangement of color value. This quilt is foundation pieced. If that's a new technique for you, definitely read Foundation Piecings Basics and Paper Piecing Tips before you begin. It wouldn't hurt to make a practice log cabin block just to get a feel for the technique. Paper piecing isn't difficult, and once you understand how to do it, you can assemble any paper pieced block with few (or no) instructions. Be sure to cut only enough fabric to make a block or two because everyone aligns patches differently when paper piecing. Mother's Fantasy Windows is an Attic Windows quilt with a twist. Instead of like-blocks sewn side by side, the quilt has multi-unit blocks in three different configurations. Speed piecing techniques make stitching this wallhanging a breeze. The light fabric that surrounds the star blocks blends with the fabric used in the center of the snowball blocks, giving the Snowballs an on-point appearance even though all blocks are sewn together in horizontal rows. The quilt measures 29-1/2" square. Alter it's theme in any way you like by simply changing fabrics; it would ​make an excellent baby quilt. Stretched star quilt blocks illustrate one of the layout choices for the versatile half-square triangle unit. This little Bear's Paw wallhanging measures about 19-inches square. It's made from four 3-1/2-inch Bear's Paw quilt blocks that are surrounded by cornerstones and pieced sashing. A dark inner border and a floral outer border complete the little quilt. Half square triangle units used in blocks finish at 1/2", a teeny size to work with. You can make them just the right size by assembling the units slightly larger than necessary and then cutting each one back to the exact size before sewing. Here's a super easy miniature wallhanging that's assembled entirely with quick piecing techniques. Half square triangle units frame the center medallion, a panel cut from a pictorial fabric. Nine-patch quilt blocks surround the center. This 56-1/2-inch square patriotic wallhanging is made from a single 30-inch Album quilt block that's placed on point and surrounded by corner squares and borders. The quilt is easy to put together, and is large enough to use as a summertime picnic blanket (make the quilt a bit larger by adding another border or two). Components are rotary cut and strip pieced. Change the quilt's theme entirely by choosing different fabrics. A black background fabric helps the colorful floral Snowball quilt blocks pop into view. Make a wallhanging with the 6" x 6" blocks or sew more blocks to create a larger quilt. Summer Dragon is a wallhanging made with oriental fabrics in shades of gold and orange. A black backdrop brings the brighter fabrics into focus. The medallion style wallhanging finishes at 48-inches square. half-square triangle units are one of the most commonly used quilt components and they can be made in lots of ways. My personal favorite is the sandwich method, but some quilters like to make them on a long grid. The units are used so often that commercially prepared grids are available, too. Consider the Magic 8 half square triangle technique for this quilt -- it lets you make eight accurate units at the same time. Rocky Glen isn't a difficult wallhanging to make if you take care that units are the correct size before you sew them together, and press carefully to avoid stretch. Choose a theme, make a quilt block -- any quilt block -- and add your favorite components to create a wallhanging that's all your own. These little wallhangings are quick and easy. This 36-1/2" log cabin wallhanging is assembled with bright holiday colors Quilt blocks are arranged in a barn raising layout. The block is slightly different than a traditional log cabin -- its red logs are taller than its green logs, and that helps make the horizontal "line" where colors meet appear to curve a bit, instead of moving in rigid stair-steps. Log cabin quilts make excellent scrappy projects, and look good no matter what type of fabrics you choose to sew with. Change your fabrics to create a quilt with an entirely different look. Through the Windows is a wallhanging pattern inspired by a carpet. Black sashing and corner triangles (at the tops and bottoms of strippy vertical rows) blend with the outer border, helping the quilt resemble a three-paned stained glass window. Blocks finish at 6" square and the completed quilt measures about 37-1/2" x 42". Marina Blues is a 68-inch square wallhanging made with two different quilt blocks. It was inspired by a beachside model home that was decorated in teals, blues, and sea-greens, with a crystal clear swimming pool outside the back door. Grace's Spools combines the traditional Spool block with reproduction fabrics from the last century. Make a 36-inch square wallhanging from 6-inch blocks or an 18-inch miniature quilt from 3-inch blocks. Use this easy wallhanging pattern to make a miniature double nine-patch quilt. The wallhanging finishes at about 25-1/2" square. You can make it much scrappier if you like, and you can go wild with color combos to brighten it up. This scrappy miniature wallhanging is made from sixteen 3" paper pieced whirlwind blocks and finishes at 21" square. The quilt blocks are quick and easy to make, but you might have to experiment a bit with patch placement because triangles can be a little challenging at first if the technique is new to you. Most people love the technique once they've tried a few quilts. And after you've made a couple of paper pieced projects, you'll know instinctively how to make them all. Newcomers to foundation piecing should read Foundation Piecings Basics and Paper Piecing Tips before sewing the quilt. Friendship quilts don't all have signature panels like the centers of these 6" patchwork star blocks. The blocks in this wallhanging are easy to make and the dark star tips and center bars don't require much fabric at all -- it's an excellent stash-busting pattern. Use the signature panels to honor family members. Ask friends to make a block and sign the center for you, or sew a darker strip in that slot if you'd prefer to do away with signatures. Here's a design that was inspired by Carol G's tree quilt in our online galleries. You can stitch it two ways, as a rag quilt or as a non-rag miniature. The rag quilt doesn't have huge units -- they finish at 4" square. The mini quilt is smaller, with each square in the quilt finishing at 2-1/2". You'll find a couple of layout and assembly options, so be sure to read through the pattern before you begin. Patterns don't get much simpler than the Road Trip quilt. Named for its meandering pathways and Route 66 fabrics, this strippy set quilt is made from columns of squares, with rectangles at the ends of a few columns to create offsets. Change the theme dramatically by altering fabrics, and if you like rag quilts, you can convert this one in a snap by altering patch sizes and using my rag quilt general instructions for assembly advice. The Log Cabin Christmas Tree quilt measures about 22-1/2" square. Decorate the tree by adding buttons or charms to serve as ornaments. Make tiny Christmas stockings and tack them on -- you can probably find a fabric with stocking images to help make that a breeze. Scattering little bows across the tree is another way to dress it up. Try this patchwork H design the next time you want to make a scrap quilt. The quilt finishes at about 42" x 42" -- make it larger by sewing more of these simple blocks. This easy Jigsaw Puzzle baby quilt pattern is assembled with the traditional "H" quilt block. Puzzle pieces emerge when you flip adjacent blocks around and pay close attention to fabric layout. The Jigsaw Puzzle quilt is a perfect choice for a scrap quilt. It's an excellent stash buster since each block requires only a small amount of fabric. If you don't have a stash yet, making the quilt is a good excuse to collect fat quarters and fat eighths of quilting fabrics. The jigsaw puzzle quilt is made with 6-inch square blocks but also includes cutting instructions for 9-inch and 12-inch variations. You'll find instructions for the Aurora Borealis Quilt on page 3 of the quilt block pattern. The quilt finishes at 60" x 60", and can be used as a large wallhanging or a lap quilt. Change it's configuration a bit (and add or subtract blocks if you would like) to make a bed quilt.